* This is my article in BusinessWorld last Wednesday. When matter changes form, there are certain “system loss” that occur. Like a one-kilo dressed chicken becomes less than one-kilo once it is cooked into adobo or tinola. Or a one-kilo green mango or banana becomes lighter than a kilo when it transforms into ripe, yellow mango or banana after a few days. When electricity is transported or transmitted from a power generation company (genco) some 100+ kilometers away to a private distribution utility (DU) or electric cooperative (EC), there is a transmission system loss. Thus, a 1,000-MW output from a genco may become only 980 MW when it reaches the DU or EC. Then when electricity is distributed from a DU or EC to houses and offices, there is also a distribution system loss. This loss is divided into (a) Technical loss, inherent in the physical delivery of electric energy including conductor loss, transformer core loss, and technical error in meters, and (b) Nontechnical Loss, energy lost due to pilferage, meter reading errors, meter tampering, others not related to the physical characteristics and functions of the electric system. The Philippines has a relatively high degree of transmission loss + distribution loss while Singapore, South Korea and Japan have low systems losses, based on World Bank data (see Table 1). There are several attempts to limit or cap the distribution system loss that is passed on to the consumers. One from the Energy Regulatory Commission (ERC) draft “Rules for Setting the Distribution System Loss Cap and Establishing Performance Incentive Scheme for Distribution Efficiency,” and two from the Senate. Here is a summary of their provisions. These three measures are problematic and Sen. Pacquiao’s bill is the worst because of its populist posturing, disallowing private DUs to charge any system loss while pampering the ECs to have their system loss. Check again Table 1 above, it shows that none of the advanced countries like Singapore and Japan have zero system loss. Sen. Gatchalian’s bill is not as bad as Sen. Pacquiao’s but like the ERC draft Rules,it suffers from some populism too, pampering the ECs with higher loss cap compared to private DUs. Giving differentiated loss cap is favoring the ECs while penalizing private DUs and this is wrong. 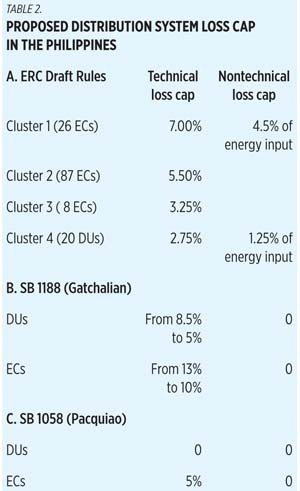 If the real purpose of the proposed ERC regulation and Sen. Gatchalian’s bill is to protect the consumers from high system loss charge in their monthly electricity bill, then they should slap a uniform low cap for all players, whether private DUs or ECs. 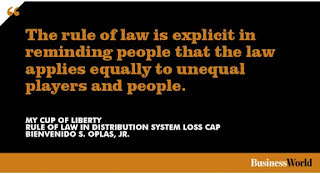 The rule of law is explicit in reminding people that the law applies equally to unequal players and people. Thus, a law against traffic counterflow should apply to all vehicles, from buses to cars, jeepneys, armored vans, tricycles and motorcycles. It should apply also to both private and public/government vehicles. A law with penalty against non-rehabilitation of mined-out area should apply to all mining entities, whether big, medium, small and artisanal mining. And a law or regulation on system loss cap should apply to all players, from big corporate DUs to medium or small electric cooperatives. By slapping differentiated system loss cap, new government regulations will not be exactly protecting the consumers but more of protecting certain ECs so that their inefficient if not outright wasteful distribution system is rewarded with higher profit at the expenses of the consumers. Ultimately, all ECs should be corporatized. They should be registered with and monitored by the Securities and Exchange Commission (SEC) and not by the National Electrification Administration because SEC has more transparent and realistic rules than NEA. But that will be another topic in the future. For now, the rule of law, of not making exemptions and differentiation in the imposition of system loss cap, should prevail. And the loss cap that government has in mind should be realistic that DUs and ECs should not be burdened with additional high capital expenditures (CAPEX) and operating expenditures (OPEX) which ultimately will be passed to the consumers in the form of higher distribution charge.